A light went on in the old guys skull this week. I have been tweaking and tuning my dough recipe, bringing it closer to those in the Pizza Bible and allowing a longer bulk ferment and adding a starter. What I didn't catch onto was that the protein level of the General Purpose flour (Rogers unbleached) at 12.2% seemed not to be able to puff the Cornichone as it once did. Where before the longer ferment (48 hours) I would have a good rise from the crust, I now had about half the rise - very good flavour, crisp and good chew but less crust. After todays trial, I just may have learned something! Another test with a new batch may confirm, Darn another pizza this week . . . . . 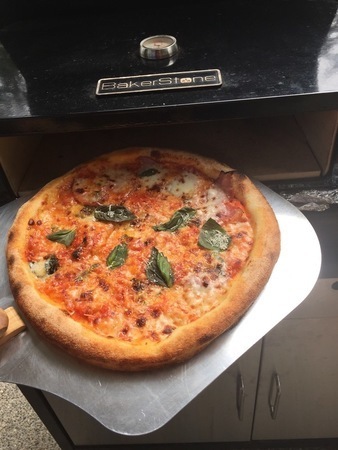 I started this a year ago with a Peter Reinhart recipe and have been modifying it since purchasing the Pizza Bible, the style at this point is Napoletana, the oven is a $99 Bakerstone which I am very happy with - 700 degrees and a 4 minute bake. I have enquired about higher Gluten flours but availability and/or shipping is a tad difficult on Gabriola. After the the above revelation I will try a bit harder to find a higher gluten flour so I can bulk ferment for a longer time. I am having a lot of fun! Thanks to all who post suggestions and resolutions a great help! Hi Gil, I usually plan on an hour to get to temperature, a bit longer in wind and weather which have some effect. Temperature ranges from 650-720 and time for bake varies with temp. Overall I am pleased, it is far more consistent and reliable than the old guy making the dough! Wasn't meant as an oven post, though interesting, I wondered if someone might give some comment about lower gluten level and ability to bulk ferment for longer than 24 hours. It made quite a difference but I have built coincidences before . . .